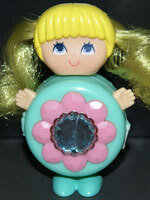 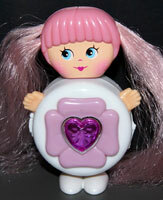 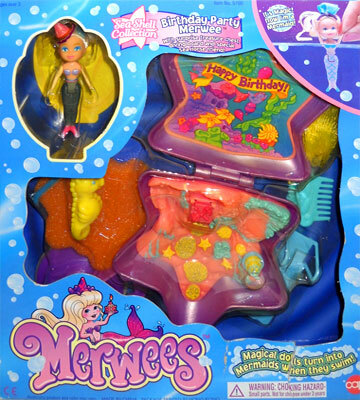 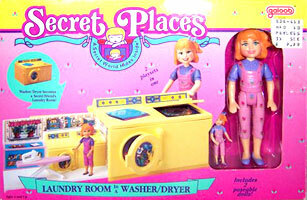 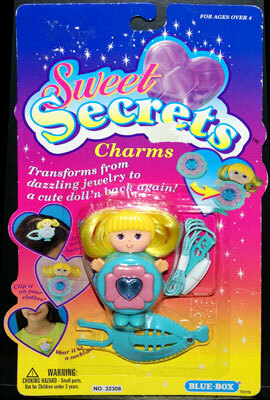 Second series Sweet Secret charms, like the first, each came with a necklace and hair-clip which they could be attached to. 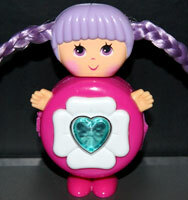 Six more doll charms were added in the second series. 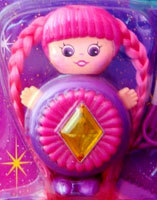 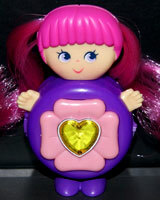 Like the first series doll, all the new dolls were produced with the three different gem styles but this time never varied from their body colouring. 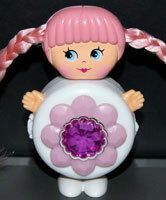 They didn't come with bows or have rosey cheeks this time. 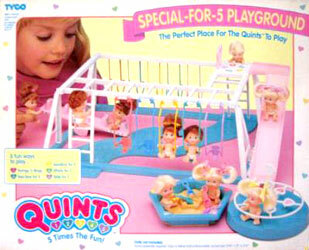 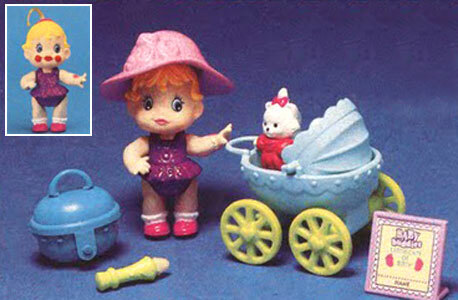 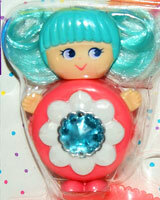 Blue Box produced all six doll charms from Galoob's second series (but not the three original dolls). 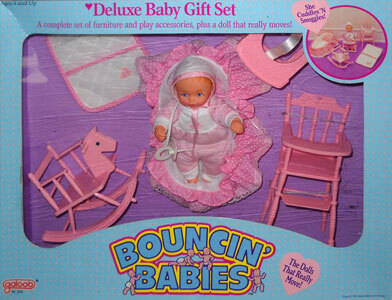 They used the same six names but for different dolls, and the dolls were almost identical apart from some small differences to their eyes (some may even have been completely identical, I have yet to confirm). 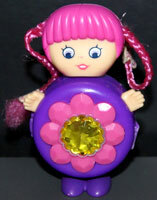 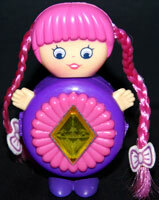 All six dolls were produced with the three different gem styles but never varying from their body colouring, just like Galoob. 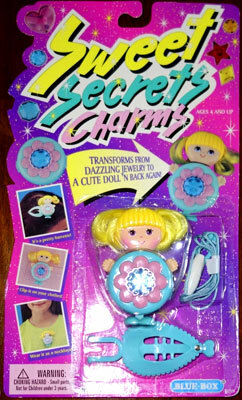 The publicity images used on the backs of packaging pictures Sparkle Heart twice and misses out Dazzle (I'm pretty sure they should be named this way around as all of the other Blue Box dolls have their names jumbled up from Galoob's - an educated guess as Blue Box didn't put the doll's names on the front of the packaging!). 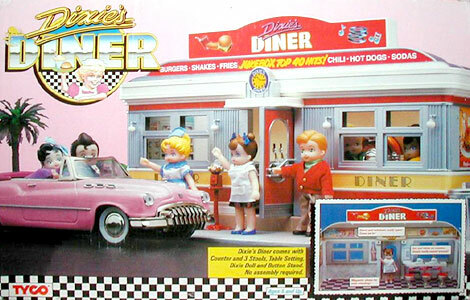 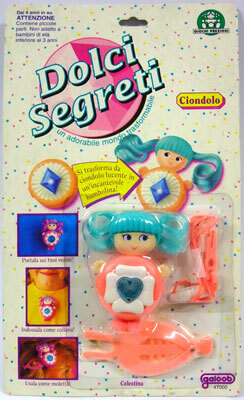 One of each of the Blue Box dolls was sold with their release of playsets too. 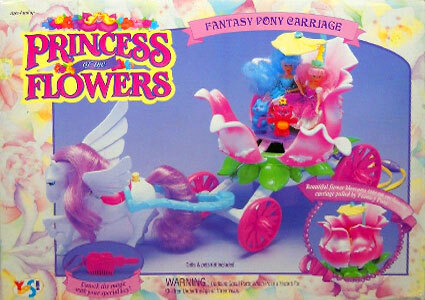 This is from the 1994 Galoob catalogue. 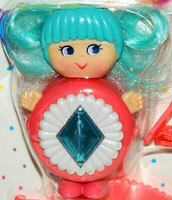 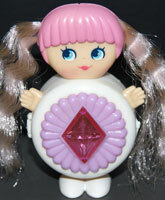 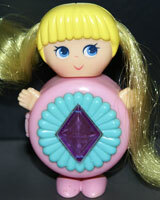 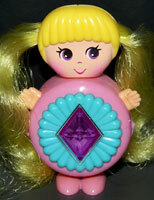 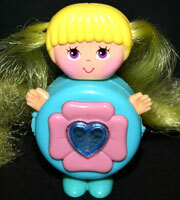 Galoob "Crystal Bright" / Blue Box "Sparkle Heart"
Galoob's doll had blue eyes. 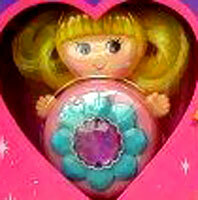 The Blue Box version had brown eyes. 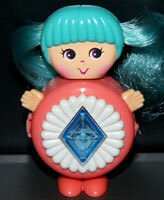 Galoob "Dazzle" / Blue Box "Star Beam"
Galoob's version had blue eyes. 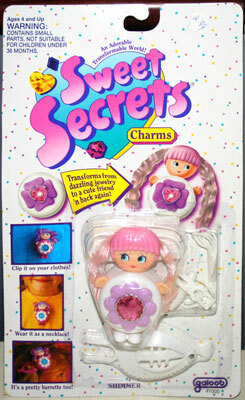 The Blue Box version had purple eyes. 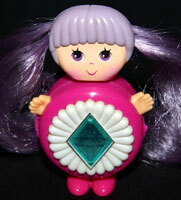 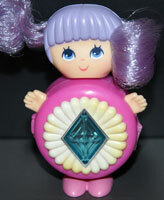 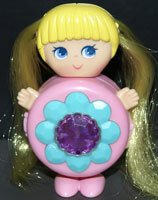 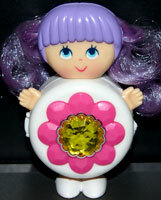 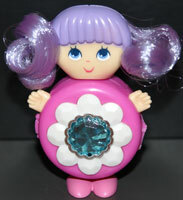 Galoob "Glitter Miss" / Blue Box "Shimmer"
Galoob's doll had light purple eyes. 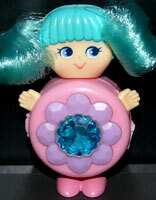 The Blue Box version had dark purple eyes. 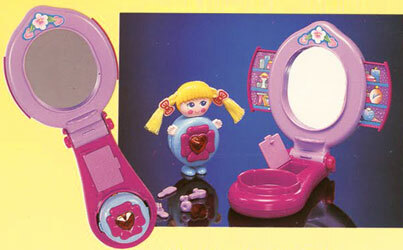 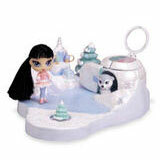 This doll also came with their version of the Mirror-Vanity playset. 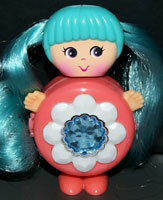 Galoob "Shimmer" / Blue Box "Crystal Bright"
Galoob's and the Blue Box version both appear to have blue eyes. 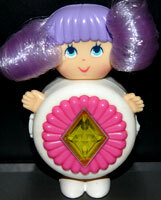 Their hair can fade over time. 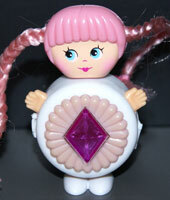 Galoob dolls had a darker edging around their eyes. 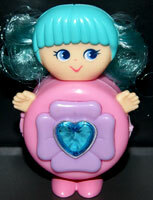 Blue Box dolls had less black around their eyes. 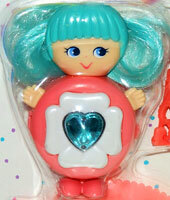 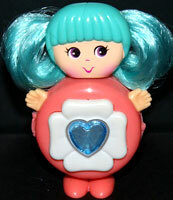 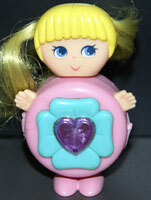 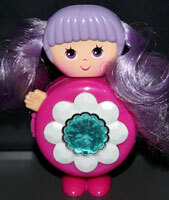 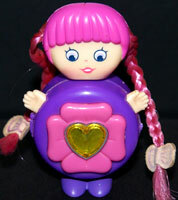 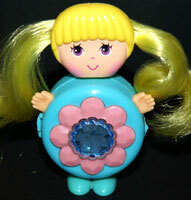 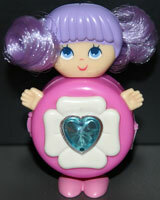 Galoob "Sparkle Heart" / Blue Box "Dazzle"
The Blue Box dolls had purple eyes. 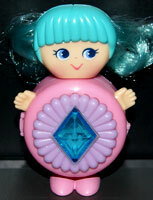 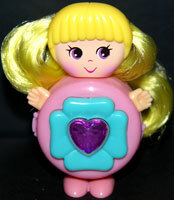 Galoob "Star Beam" / Blue Box "Glitter Miss"
Blue Box dolls had purple and were a different shape. 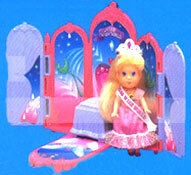 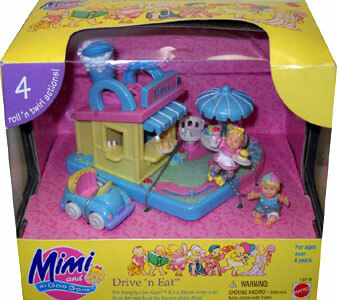 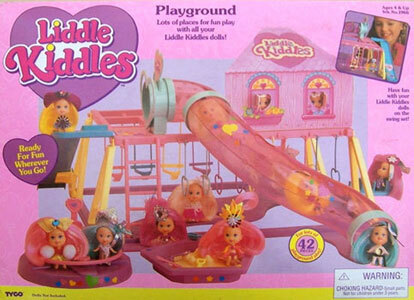 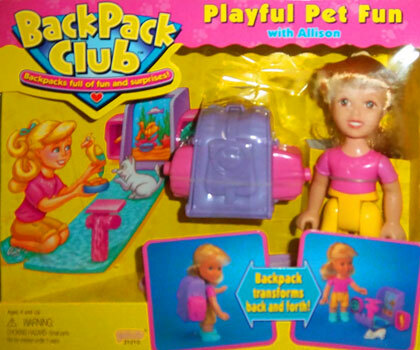 Second release playsets from Galoob had new dolls inside. 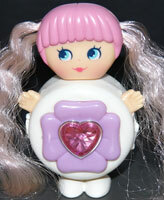 These are always mistaken for varients of other dolls, but were all new characters with their own names. 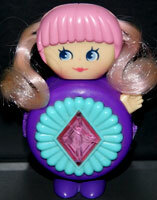 Jewellery Box Playhouse (version 4) "Pixie Bright"